When will the Turkey Hunting Video & Photo Contest results be posted? The Season is half over, lets join forces and make some memories and good times! What can I say??? This rarely happens to us dedicated Wild Turkey Chasers ( I call us 'Chasers' bc it's a more fitting description of what we really do) - a 55-minute hunt, all textbook. You know... opening morning, cool, crisp with that breathe of golden sun just beaming though the pines; the Crows and bird life almost seem deafening. The air is broken repeatedly by the thunderous drones of gobbles the Ole' Boy is belting out. You make some sweet seductive hen chords from your favorite calls, he answers solidly... he's on his way! He shows up gobbling, he presents himself.... BOOM - he's down for the count.... your heart is racing, wondering if this is real or a dream. 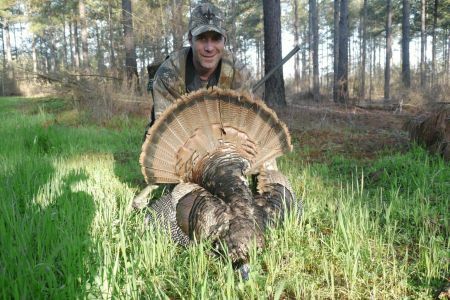 YES, it is real, you've just harvested a legal wild turkey on opening morning of the 2011 Mississippi Spring Season in under an hour.... wake up, run after him now! WOW! What a great experience this was for myself and good friend Byron Styron of Harahan, LA. This could not have happened to a better Guy. Byron has been trying to harvest his first bird for 3-years now, he finally sealed the deal here. With an invite from him to video his hunt, I was able to document and present his outstanding hunt/experience to you. I hope you enjoy! ** if you would like a professionally documented hunting video please contact me for additional info. Highly motivated life-long learner, over-achiever, and researcher with professional proficencieis in Photography, Video Production, Post Non-Linear Editing, Pro-Audio, Web Mgmt, Large-Scale Plotting & Printing, Geospatial Technologies, Mapping, and GIS/GPS who works both well as a 'Team Player' or as a 'Solo Soldier' seeking freelance journalistic opportunities & work.